HET High Efficiency Toilet – 1.1 or 1.6 Gpf gives users freedom of choice. It saves money lowering your water bill and saves a vital natural resource. WaterSense compliant – At least 20% more efficient than 1.6 Gpf without sacrificing performance. Pilot-Operated, Anti-Siphon fill valve – provides consistent shut-off over a wide range of water pressures and easily adjusts to retain optimum water level. 3” Dual Flush Tower – Designed for maximum flushing performance. It seals tight every time, and won’t rust or corrode. Maintenance is simple and saves time with easy seal replacement. 3-bolt installation – The 3 bolt system provides a sturdy level connection between tank and bowl and saves installation time. Classic Design – Complements any bathroom décor. Multiple Solutions – Available in 3 configurations covering all your application needs: Round Front, Elongated and Elongated SmartHeight. 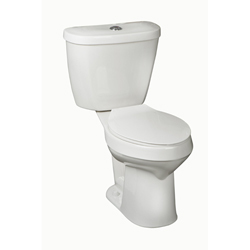 Made in the UNITED STATES – the only toilet in its class made in the US. Meets Buy America / ARRA requirements.